People protect what they love. Jacques Cousteau directs a diving craft’s launch in the late 1950s. Born on June 11, 1910, in Saint-André-de-Cubzac, Gironde, Jacques Yves Cousteau was a French naval officer who became one of the world’s greatest explorers, ecologists, filmmakers and scientists. His passion was the oceans of the world and the sea life in them, and he co-developed the modern “aqualung” – the SCUBA tank and regulator – making underwater exploration accessible to scientists and the masses alike. He died on June 25, 1997. In Malta, Jacques-Yves Cousteau discovered a former Royal Navy mine-sweeper that had been converted to a ferry and named Calypso. The ship was christened in 1942 but her first prosaic name, J-826, belied the exceptional life she would lead. To Cousteau, she was the ideal ship for his plan to explore the seas. Thanks to the financial help of Loël Guinness, the sale contract was signed on July 19, 1950. Calypso left immediately for the shipyard in Antibes, France, where she was transformed into an oceanographic ship and a new Calypso was born. One of her many innovations was the ” false nose “, or underwater observation chamber built around the prow and equipped with eight portholes for viewing. Much of the equipment was donated by the private sector, including many companies, and the French Navy. Jacques Cousteau and his wife Simone also devoted a major part of their personal resources to the ship. 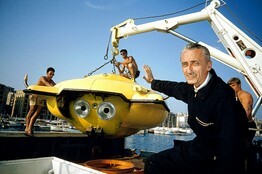 Cousteau is the son of Jacques-Yves Cousteau and Simone Melchior. Cousteau first dived with an aqua-lung in 1945 when he was 7 years old. Although he went to school to study architecture, he became part of his father’s Cousteau Society, serving for twenty years as executive vice president before striking out on his own in 1993 to produce environmental films. Cousteau and his father had disagreed about the management and policies of the Society. Ocean Futures Society, a non-profit marine conservation and education organization, serves as a voice for the ocean by communicating in all media the critical bond between people and the sea and the importance of wise environmental policy. As Ocean Futures’ leader, Jean-Michel serves as an impassioned diplomat for the environment, reaching out to the public through a variety of media. The Miami & The Beaches Environmental Film Festival presented last Friday The World Premiere of My Father, the Captain: My Life with Jacques Cousteau, presented by his son, Jean-Michel Cousteau. 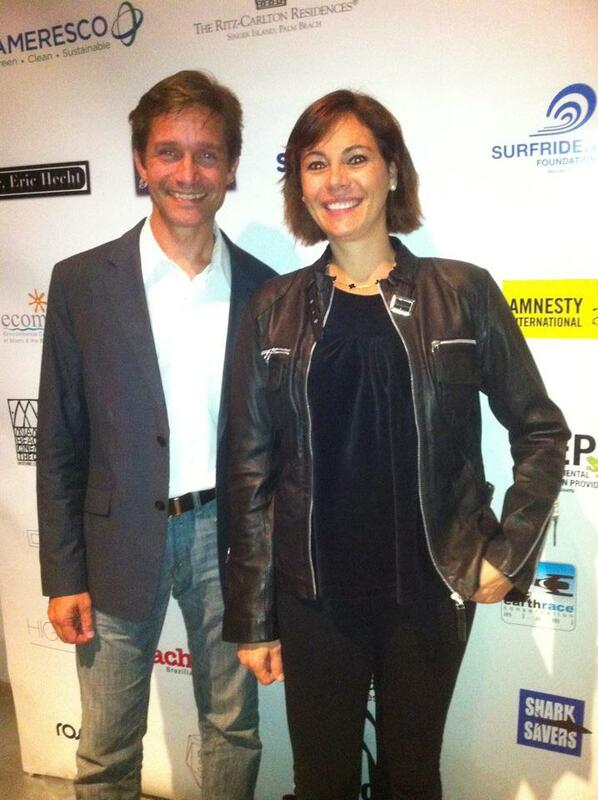 Fabien Cousteau & Adriana Sassoon at the Miami Beach Premiere My Father the Captain.